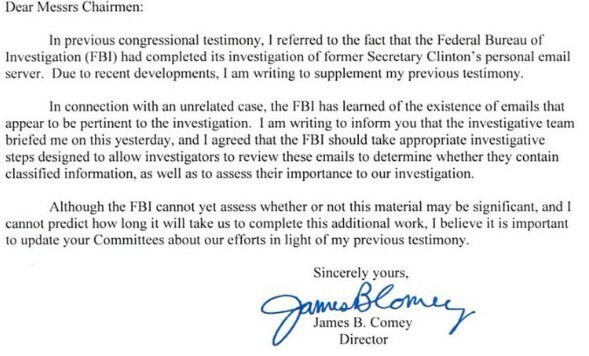 So last Friday the FBI Director James Comey sent a letter to Congress. (view the letter here) Since then Republicans and Democrats alike have been losing their minds over the whole thing. Republicans have been lauding him while the Democrats have been bashing him, what a switch from a couple of weeks ago when it was the other way around. for your reading pleasure I have pasted the letter below that was sent to both Republicans and Democrats on Friday. In all honesty I don't think that this letter says much it is simply informing them of their actions and keeping them updated on the status as he promised he would per his sworn testimony. As I have stated in previous articles I am neither Republican or Democrat, I am registered as "no affiliation" in my home state of WV, so do not take what I am about to say as an attack or trying put down a particular party. (b) Whoever, having the custody of any such record, proceeding, map, book, document, paper, or other thing, willfully and unlawfully conceals, removes, mutilates, obliterates, falsifies, or destroys the same, shall be fined under this title or imprisoned not more than three years, or both; and shall forfeit his office and be disqualified from holding any office under the United States. As used in this subsection, the term "office" does not include the office held by any person as a retired officer of the Armed Forces of the United States. You see if Mrs. Clinton would have surrendered her server and emails at the time of the first inkling of her pending investigation none of this stuff would be happening to her now, and we would not have to use taxpayers money to hunt down and investigate all her emails to find out if she were being truthful or not. It's almost like she thinks this is a game or a big joke except for the fact that the American people are the only ones that lose and the joke is on us. I am sorry to say that any one that could vote for her, need only research a little to find that this is not the first time she has had controversy surround her. One of the best examples is the "Whitewater" investigation, when a computer disappeared with the Rose Law Firm accounting records on them, and then Vince Foster's files that the FBI looked for two years only to find them in 1996 in Mrs. Clinton's private book room next her office on the third floor of the White House. (See the New York Time's article "Hillary Clinton's Fingerprints Among Those Found on Papers") Need I mention Travelgate & Cattlegate to name a few more controversies. In closing I would implore those that would vote for her because she is a Democrat, a woman or because she has made shallow promises about what she has said, done or says she will do during this election, please reconsider and petition the DNC to ask her to step down she is not fit too run or hold office and at least if she were to step down, I would be more inclined to vote for someone like Tim Kaine rather than Trump. From as neutral a perspective as I'm able to muster I agree that she should not remain a candidate because she has shown blatant disregard for the law of the land and security of sensitive information which may pertain to national security. As a Republican perhaps I should be delighted, but since it became clear that Donald Trump would be the GOP candidate at the top of the ticket delight has not been my feeling. Do I prefer Donald to Hillary? Yes, but only because I know so very little about Mr. Trump and so very much about Mrs. Clinton. Previously Director Comey appeared to bend over backwards to say that she's either a crook or an idiot, but that the government would not pursue criminal charges. This looked dirty and it looked political, but the Democrats applauded his neutrality and his strong moral character. Now he simply informs congress that new information has reignited an investigation related to emails and Mrs. Clinton. Director Comey is now praised by Republicans for being brave and have the strength of character to move forward while he is vilified by Democrats. Mr. Comey may or may not be a dirty cop, but he is in an unenviable position. The biggest disappointment and greatest disservice to the American public outside of the Washington beltway however is being perpetrated by the news media who, driven by ratings and by a political agenda, have failed to provide accurate and neutral information. Furthermore, thanks to Wikileaks we see even that the media have been tacit if not active supporters of Mrs. Clinton even by sharing with her a list of questions prior to a public debate with Mr. Trump. There is a sentiment given form in a Trump candidacy that is coming to a boiling point. What happens next is anyobodys guess.